Anyone dealing with food allergies knows how hard it is to eat normally. You either can give up the restricted foods from your diet or turn to replacements, which often can be safe to eat but lack the same flavors. 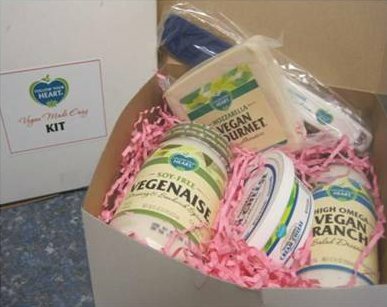 However, Follow Your Heart sent me some vegan food products for this review that were so delicious they can fool you into thinking what you were eating was the real thing! Their Vegan Gourmet Cream Cheese had the same creamy texture of the regular dairy version with incredible similar taste. I could have cooked something with this, but this cream cheese was so yummy that the family and I gobbled it up on sandwiches immediately before I had a chance. The next thing that we tried was the High Omega Vegan Ranch Salad Dressing on our salads. I dare anyone to tell me that this was any different in flavor than a leading brand of regular full fat ranch dressing only Follow Your Heart’s version is healthier with Omega-3 fatty acid-rich from hemp and flaxseed oils. Mayonnaise is typically not the healthiest thing to eat every day with all the fats. Of course, you can try to still eat it with the low-fat and the no-fat substitutes readily available at the grocery store. At the same time, those substitutions can have a void in flavor–that is until you taste Follow Your Heart Soy Free Vegenaise. This is a fantastic egg free, gluten free, soy free spread that can fool you into believing you were eating mayonnaise. We spread some on our sandwiches and were impressed how excellent this product really was. The Vegan Gourmet Mozzarella was equally wonderful. I sliced some of this gluten free, soy-based cheese for our sandwiches and loved the flavor. It was a softer texture, a great mozzarella imitator that also cut nicely and vanished soon upon arrival. Forty years ago in Canoga Park, California, four friends followed their dream and started a small business with the Follow Your Heart Market and Restaurant. Their revolutionary idea and quality products soon took off. As a result, the company keeps expanding with new vegetarian products and natural foods manufactured in a solar-powered plant because of their belief and dedication in improving the environment as well as healthier food alternatives! I honestly recommend these Follow Your Heart products and would love to try more of their fine products soon. Seriously, you will continue to enjoy all the excellent vegan food products in their line without even realizing that they were substitutes! You can locate a store near you or shop online, but do yourself a favor and try the delicious difference of their vegan food products for yourself. i'd to try the Mild Balsamic Barbecue Sauce. We love vegetables and I love your blog!